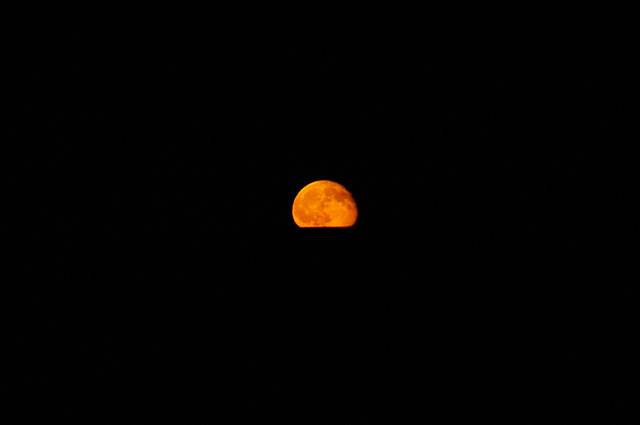 I decided to go to the edge of the high desert tonight to watch the moon come up over the horizon. It was moving/powerful experience — one that the photo cannot convey. It was interesting to watch the moon cause a glow above where it would be rising, before it broke my view of the horizon. I took several dozen images. One of the things I am always reminded of, is how FAST the moon rises. (Just as fast as the sun sets) A few other images in sequence are on my flickr page. I tried to capture it just as it surfaced and that shot is on my flickr page. It is the one where the light is cut in half by a utility pole in the distance. Being just a few miles from the middle fo nowhere, standing there, alone, in the quiet, watching darkness come, and the moon rising, is a moving experience. I was only a few miles from where I was raised, (until the age of 5). I started to wonder tonight if perhaps this remote, dark, edge of the desert location, is not somehow imprinted in my psyche. I just loved the sense of isolation. I wonder if it felt like “home” on some level?